This morning I surfed a link to the movie FOOD INC while eating my homemade rawnola and having tea. It will never show up in my town but a friend has it backordered online. Then after a few other distraction, petition signing and updates on the metro crash I looked back at my cereal bowl and said to my self " I want to blog about organic buckwheat groats". 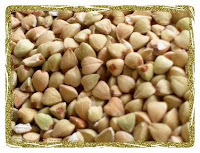 BUCKWHEAT GROATS - (taken from a book by Gary Null) When roasted these gems are known as kasha. Buckwheat has more then 90 percent of the protein value of milk sol ids, and more then 80 percent of eggs. A pound of buckwheat provides protein equivalent to a half-pound of beef. It contains high amounts of all eight essential amino acids and is closer to be a complete protein than any other plant source, including soy beans. You can purchase them at a whole foods. I get mine from a the bins at Native Sun in Jacksonville, FL. Cheers for buckwheat pancakes but that isn't the only thing you can do with buckwheat. 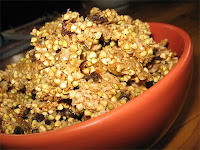 Here is a link from the sunnyrawkitchen for granola. T his recipe is similar to mine and is flexible to what you have on hand. Here are links to a couple simple pancake recipes. Of course it is cruelty free of eggs and dairy products which are better for our health, the environment and the baby cows and chickens. ( side bar- did you know that all animals that are confined in factory farms are pumped up to a ripe age of a baby and then slaughtered?. Yes! All the animals that people consume are still babies. That is a fact. Mix all the wet ingredients together in a small bowl. Mix all the dry ingredients together in a slightly bigger bowl. Add the wet to the dry and stir just enough to combine. Don't overmix which is how you get tough pancakes. Place banana slices on as you cook or afterwards. Pancakes can be a nice "breakfast for dinner" especially in the heat of summer. Sprinkle the blueberries on top of the pancake after you pour the batter into the pan. This will keep the batter from turning blue, which happens when you stir the berries into the batter. Squeeze a bit of lemon juice into the soy milk and let it sit a few minutes to thicken up. In a separate bowl, combine the dry ingredients and set aside. Once the soy milk has thickened up, give it a stir and pour a small amount of it into a dish and whisk in a slightly heaping teaspoon of egg replacer powder. Stir the remaining wet ingredients into the soy milk mixture and pour over dry ingredients. Mix batter until ingredients are just combined. Lumps are fine. At this point you can either gently fold in blueberries (if using frozen berries, don't bother to thaw them) or sprinkle the blueberries over the pancake batter after you pour it into the skillet (they'll sink into the batter). Cook pancakes in a lightly oiled and preheated non-stick skillet. I use a 1/3 cup measure to pour the batter into the skillet and end up with a total of six pancakes everytime. Serve pancakes with maple syrup. Cassie Young's blog Veggie Meal Plans.